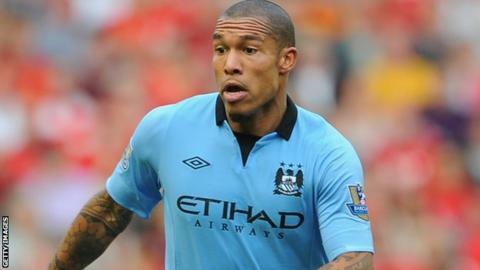 Nigel de Jong has joined AC Milan from Manchester City, the Italian club has confirmed. The Netherlands midfielder, 27, has signed a three-year deal with the 2007 Champions League winners. De Jong, who was in the final year of his City contract, made over 130 appearances for the club. The 2010 World Cup finalist joined from German club Hamburg in 2009, signing a four-year contract. Manchester City manager Roberto Mancini said: "I am sorry because Nigel was an important player for us but if he is happy, I am happy for him. I am sure he will do really well in the Italian championship." Mancini is hoping to sign three players before the transfer window closes. "We have another 10, 12 hours to close on these players," he added. "I think if we close these players, I think we improve our team."